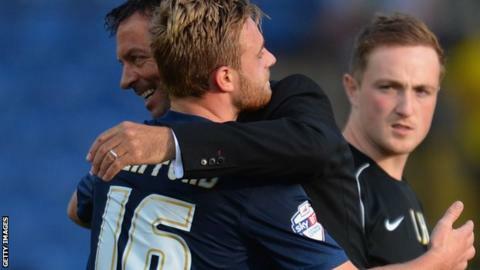 Carlisle are still looking for their first win of the season after being held to a 1-1 draw by Southend United. Midfielder Antony Sweeney gave the Cumbrians the lead against the run of play just before the break when he headed home a Patrick Brough cross. However, the lead was short lived as Conor Clifford hit back for the Shrimpers in first-half injury time. Clifford picked the ball up 25 yards from goal and drilled in a low shot to keep his team eighth in League Two. Match ends, Carlisle United 1, Southend United 1. Second Half ends, Carlisle United 1, Southend United 1. Antony Sweeney (Carlisle United) wins a free kick in the defensive half. Attempt saved. Kyle Dempsey (Carlisle United) header from the centre of the box is saved in the centre of the goal. Attempt saved. Kyle Dempsey (Carlisle United) header from the centre of the box is saved in the top centre of the goal. Attempt missed. Myles Weston (Southend United) left footed shot from outside the box is too high. Corner, Southend United. Conceded by Mark Gillespie. Attempt saved. David Worrall (Southend United) right footed shot from the right side of the box is saved in the top right corner. Corner, Carlisle United. Conceded by Ryan Leonard. Corner, Carlisle United. Conceded by Luke Prosser. Attempt missed. Myles Weston (Southend United) left footed shot from the centre of the box is too high. Attempt blocked. Billy Paynter (Carlisle United) right footed shot from the centre of the box is blocked. Substitution, Southend United. Lee Barnard replaces Barry Corr. Attempt blocked. Conor Clifford (Southend United) right footed shot from outside the box is blocked. Delay in match Stephen Elliott (Carlisle United) because of an injury. Substitution, Carlisle United. Stephen Elliott replaces Jack Marriott. Substitution, Carlisle United. Kyle Dempsey replaces Gary Dicker. Ryan Leonard (Southend United) wins a free kick in the attacking half. Will Atkinson (Southend United) wins a free kick in the defensive half. Hand ball by Barry Corr (Southend United). Corner, Southend United. Conceded by David Symington. Substitution, Southend United. Will Atkinson replaces Kevan Hurst. Attempt saved. Myles Weston (Southend United) left footed shot from very close range is saved in the centre of the goal. Attempt saved. Barry Corr (Southend United) right footed shot from the centre of the box is saved in the bottom left corner. Attempt blocked. Shaquile Coulthirst (Southend United) header from the centre of the box is blocked. Billy Paynter (Carlisle United) wins a free kick in the attacking half. Corner, Southend United. Conceded by Danny Grainger. Corner, Southend United. Conceded by Paul Thirlwell.